Ford never included rumble and trunk seals, but we have found this is the answer to loose and rattling lids on all early Fords. The sponge rubber seal has a pressure sensitive adhesive on the back; all you need to do is peel and stick. It can be used in other applications as well. An ideal universal type seal, Hollow core for improved compressability and sealing - 5/8 X 3/8 X 20' Roll. 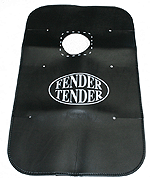 Fender Protector for the 1928-31 Model A Ford. Made out of the same material as our fender pad, just lay across your rear fender when people are getting in and out of the rumble seat to protect the paint. The rumble step plate keeps it from sliding off. Rumble Stop kit 1928-31. This kit fits both the 28-9's as well as the 30-31's. Comes with all you see. The upper bracket is aluminium, and the lower (long/skinny) bracket is stamped steel. You will have to drill the holes. Made in USA. 1928-31 Rumble Hinge Fastener Kit, includes the two special shoulder bolts, square washers, screws and nuts. Complete set less the brackets. 44 pieces. Rumble seat grab handles for the 1928-31. Stainless handles that mount on each side of the rumble seat. When the top is folded down, the top will rest on these. Also helps fat ladies or (guys) get in and out of the rumble seat. Set of 2. Rumble Grab Handle Braces 1928-31. These two stamped steel braces go under the quarter panel where the grab handles mount for reinforcement. Made in USA. Rumble Grab Handle Screws 1928-31. 12 pc. Set of screws, nuts and lock washers to mount the rumble grab handles. Made in USA. Rumble Alignment Plates 1928-31. These go in the top corners of the rumble rain gutter to align the lid when you close it. Made in USA. Trunk Alignment Plates 1928-31. These plates go at the lower end of the trunk rain gutter to align the lid when it gets closed. Made in USA. Rumble Lid Bumper Set 1928-31. The rubber stops for the top and bottom of the rumble lid. Boot Lid Bumpers 1928-31. The rubber bumpers for the lower corners with a trunk lid. Made in USA. Rumble Lid Bumper Bracket 1928-31. Pressed steel bracket at the upper corner of the rumble rain gutter that holds the lid bumper. Made in USA. Rumble Seat Hinge Kit 1928-31. Hinges, braces and all necessary hardware for mounting rumble lid to body. Made in USA. Note: When installing new hinges on your deck lid, it is sometimes necessary to use flat washers to shim between hinge bracket and deck lid. Deck Lid Hinges 1928-31. The hinges required to mount the deck lid as a standard lift up trunk. Not an ill fitting import kit, this is a quality U.S made kit that includes everything. Made in USA. Deck Lid Support 1928-31. Holds the deck lid up when you access the trunk. Fair quality, use original if possible. Deck Lid Support Bolt Kit 1928-31. 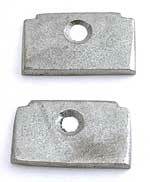 Special shouldered bolt, nut, and washers that attach to the inner edge of the rumble rain gutter. Support slides on the shoulder of this bolt. Twelve screws to attach the cast rumble hinges to the rumble lid. Made in USA. Rumble seat Lid Striker 1928-32. When changing over to a rumble seat, use this style striker plate for the rumble lock. Made in USA. Deck Lid Trunk Striker 1928-31. When using the rumble area as a trunk, you will need this to latch the lid. This latch is far superior to some of the cheaper variants on offer and is made properly, as well as functioning as it should! The latch is used for 1928-29 Model A Ford either as rumble seat or boot, or if you have a 1930-31 with the lid hinged as a boot. This lock unit was used on the 1930-31 Model A Ford with the deck lids hinged as rumbles. These latches are new, are the best quality on the market. Made in USA. Rumble Handle 1928-31. The locking rumble handle for any of the Coupes or Roadsters. Chrome plated. (Don't forget to order the rubber pad for underneath the handle A-702356-E). Scroll Rumble Handle 1928-31. Originally, this handle was used on the Cabriolets. It will also fit the Coupes and Roadsters. Chrome. 1928-31 Rumble handle pad. The rubber pad fits between the body and the door handle. It's the finishing touch. Made in USA. Deck Lid Lockwasher 1928-31. Special style lock washer that slides over threaded shank before installing the acorn nut. Fold ear over to hole nut. Made in USA. Deck Lid Acorn Nut 1928-31. Special acorn nut that holds the rumble handle in place. Made in USA. Rumble Step Plate 1928-29. This plate goes on the fender, and one on the bumper bracket. Square was used from the beginning of production until February of 1929. Step Plate Pad 1928-29 Square. Rubber pad with a nice bead around the outside edge. Go between step plate and the fender. Made in USA. Rumble Step Plate 1929-31. The plate that goes on the fender and on the bumper bracket. The round style was used from February of 29 until the end of production. Cast Aluminium. Round rumble step plate mounting kit. Includes carriage bolt, nut, and contoured fender washer. Made in U.S.A. Goes between the round rumble step plate and the fender. Original style dark fiber material 4-1/8" diameter. Step Plate Pad 1929-31 Round. Rubber pad with a nice bead around the outside edge. Go between step plate and the fender. Made in USA. Step Plate Bracket 1928-31. Cast iron bracket that bolts to the bumper brackets for the rumble step plate. This rumble seat step plate bracket was unique to early '28 vehicles. It attached to the passenger sub side rail. Cast bronze. This is the panel just below the rumble lid on the inside. When converting the trunk to a rumble seat, this panel is needed so the rumble lid will have clearance when opening and closing. The top of this panel mounts to the panel below the deck lid, and the bottom sits on top of the rumble platform.